How To Use Google Finance For Smart Trading Decisions? Trading Tuitions > Categories > General > How To Use Google Finance For Smart Trading Decisions? Google Finance is one of the super powerful tool among the dozens of free services offered by Google. Millions of traders and investors worldwide use it everyday. You can do numerous things in this lightweight web application absolutely free of cost. Whether it is managing your portfolio or fetching stock quotes from any exchange in the world or setting up a Stock screener, Google Finance makes everything easier for you. There were bunch of Google Finance API’s available few years back, but unfortunately they are deprecated now. But we still have the liberty to use Google Finance data in Google Sheets or Docs. In this post, we’ll figure out how to use Google Finance for smart trading decisions. We’ll uncover some cool features of Google Finance which would definitely help you going forward. In the topmost tab you can specify Country, Exchange, Sector and Currency. While in the lower tab you can specify the screener criteria. Click on the ‘Add Criteria’ button to see more options. Check the below screenshot where I have screened for Indian Stocks whose 52 week price change is greater than 20%, P/E ratio of atleast 10 and market cap greater than 100B. A careful study of trends for a particular sector can help you determine a pattern and make a profitable trading bet. The only known limitation is that the trend is calculated using Google US traffic statistics. You would see a list of sectors in the left hand side of the screen. Click on a particular sector to see its trend in the form of a graph. The below screenshot shows trend for ‘Computers and Electronic’ sector. At a quick glance, the above graph shows that the trend for this sector has been declining constantly from last 10-12 years. Now wonder IT is no longer a booming industry. Google Finance measures the search volume of keywords against everything else that is searched for on Google Search. This means that a rise or drop in the relative search volume of a particular sector doesn’t necessarily mean that that sector is being searched for any more or any less than it currently is. It simply means that its searches make up a larger or smaller proportion of everything that everyone is looking for on Google Search. You can download the trend data in an Excel sheet for your further study. Google Domestic trends may not look very useful now, but this is certainly going to be a powerful tool for market analysis in future. Market sentiments are governed by mass opinion which is reflected organically in these trends. Apart from Stock screener and Domestic trends, Google Finance also offers powerful charting feature with dozens of indicators. These charts refresh in realtime for majority of exchanges in the world. 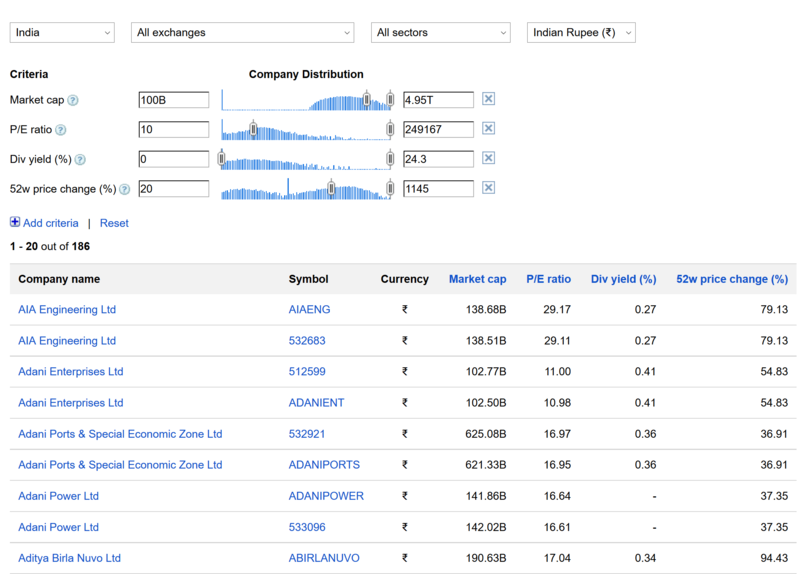 You can create and track your stocks and mutual funds in Google portfolio which is also free to use. So why to spend thousands to bucks on a sophisticated charting application when you have Google Finance available at absolutely no cost. For beginners we highly recommend to explore Google finance and develop a habit of using it. Thanks for post about google finance…..
Stock Screener criteria is not working for me, if I give criteria for some individual sector such as Basic Material. It throws error of N/A. Even if I allow All Sectors and give any different criteria such as PE Ratio above or below, I get all the 1971 NSE stocks in the result page. Surprisingly, its not working for me too. May be some issue with Google Finance. Already reported to them. I agree, screener.in is faster than Google Finance.